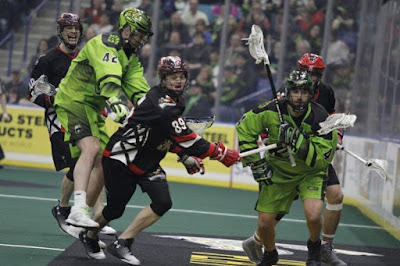 Saskatoon SK - A 5-for-5 performance on the power play paced the Saskatchewan Rush to their 10th win in the last 11 games against the arch-rival Calgary Roughnecks. 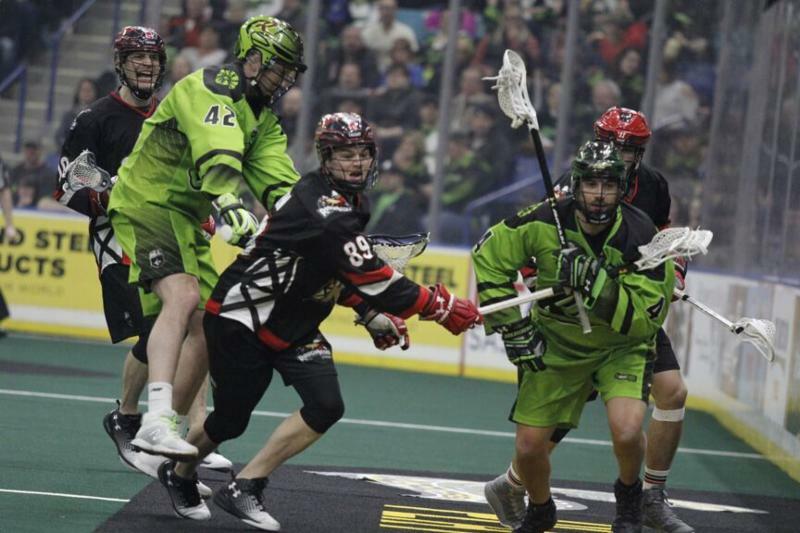 Mark Matthews netted three goals, including the game-winner on a third-quarter man-advantage, as the Rush cruised to a 10-6 victory before a sold-out crowd of 15,075 fans at SaskTel Centre in Saskatoon. The win secured a playoff spot for the Rush (9-2) as well as the season-series against the Roughnecks (4-6) for the third year in a row. “It’s big to win the season series and we have the advantage on everybody in the division,” said Rush GM/head coach Derek Keenan, whose team had a four-game winning streak snapped in Rochester last weekend. Matthews finished with seven points as he and Keenan both counted four assists. Kirk was named the game’s first star in totaling 37 saves. The Rush’s two-game homestand concludes next Saturday as they host the Vancouver Stealth. The Roughnecks have a bye next weekend and return to action March 10th on the road against the Colorado Mammoth. 15,075 Delirious Fans see the Number one team win Big again in a Sold Out Saskatoon Arena. Rush are playing hard and well as they sit on top in overall standings.. Go Rush Go ! I'm glad the Rush have taken over Saskatoon from hockey. Means Saskatoon will never get an AHL team. Saskatoon will be getting an AHL team far sooner than you think. You heard it right here. Who really cares about Lacrosse and must not be much up in Saskatoon for entertainment these days! Thank god we have a professional sport here with the Riders and not the Rush! NLL and AHL!!! Saskatoon is becoming a big deal in the world of sports. At least the foolish talk of CFL and NHL coming to the Paris of the Prairies is over. I still giggle when I hear Paris of the Prairies. Just think Buddy. You probably wouldn't have the Riders if it wasn't all Government workers that live in the "so called Queen City which by the way is much SMALLER than Saskatoon. You probably don't know the difference between a Lacrosse Ball and Knitting Needles anyway so why Knock it. That's what makes Saskatoon such a failure, they have 350,000 people in the area, a better private sector than Regina, and they still can't support their hockey. The usual Government town and we're bigger come back. Toon town where the biggest employers are the U of S and Health Region no government money at all. Not knowing the difference between a Lacrosse Ball and Knitting Needles is what most Rush fans know about Lacrosse. Toon town and your ongoing inferiority complex. Pats finish the season series with a 3-2-2-1 record against Saskatoon. 6 of 7 You must have taken a knitting needle to the head! saskatoon has nothing else. Let them have their fringe sport. No one cares about the NLL. As bus loads of fans from Regina, Weyburn, Swift Current enjoy watching the game. Don’t knock it until you be a part of it. Chris Jones and Nik Lewis were at a game last season, told me they had a blast. Be open to the possibility there are other sports out there.